HAMILTON COUNTY, IN Forty percent of all water use in summer months is on lawn and garden care, according to the Hamilton County Soil & Water Conservation District. That number could be reduced by simply collecting water for free in a rain barrel. A rain barrel is typically a 55-galloncontainer, with a screen grate at the top to keep out debris and insects and a spout at the bottom. The barrel is placed under a downspout to collect rainwater from a roof. Rain barrels also need to be elevated from the ground to help the water flow out faster. photo courtesy of Claire Lane, Urban Conservationist for Hamilton County. “It’s great because it’s a source of free water that you can use,” said Claire Lane, Urban Conservationist for Hamilton County. Bobby Kimball, a homeowner in Hamilton County, became interested in rain barrels because of her love for native plants, which she said were expensive to keep watered. 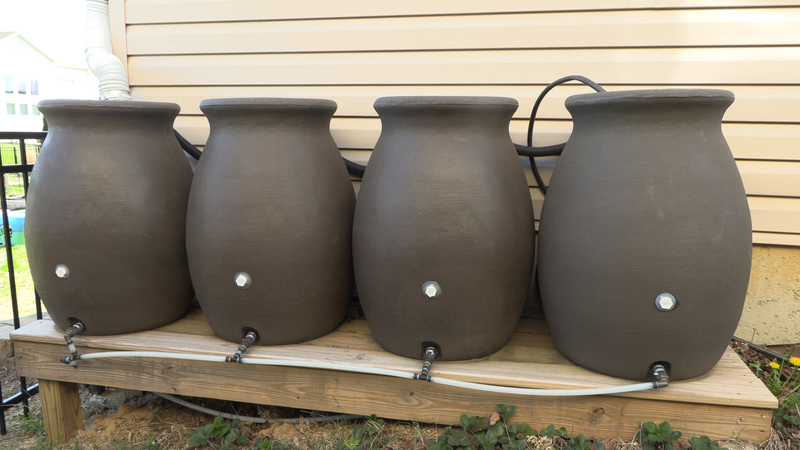 She began with one rain barrel but now has a complex system of five connecting rain barrels attached to one downspout on the left side of her home and a second five-barrel system on the right. Margot Gibson is committee member for CCS Plots to Plates Organic Garden in Carmel, where the community garden uses rain barrels as a water source for plots that aren’t located near one of the two spigots on the property. They also use rain water collection as a teaching tool for school children who take fieldtrips to the garden as well as at public events. 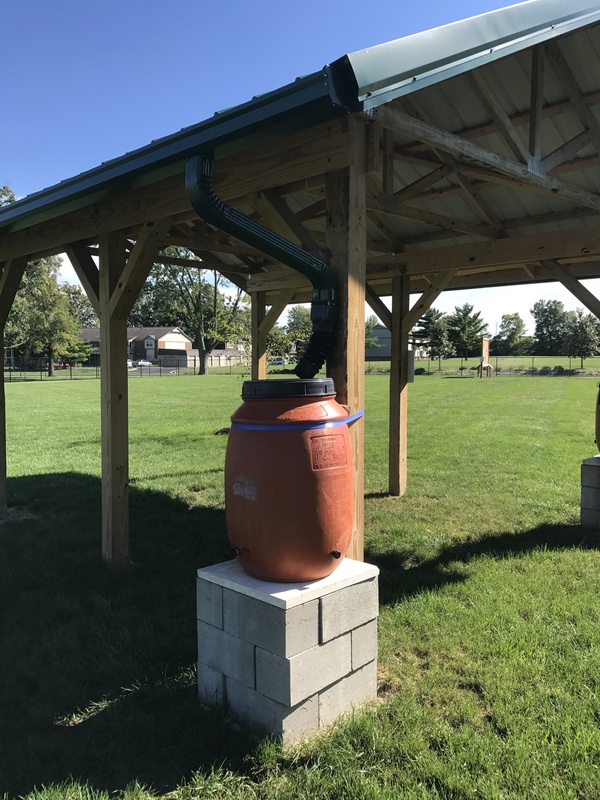 “The rain barrels are great because not only do they help us collect water, but they help us teach other people that having a rain barrel is not that hard. We have held workshops on how to make your own from a used pickle barrel,” said Gibson. In addition to gardening, the water can used to wash pets and cars, or for a pool, but it can’t be used as drinking water. Rain barrel usage has many other benefits besides saving money. Diverting the water into barrels reduces the amount of contaminated runoff into rivers and lakes and helps protect watersheds. 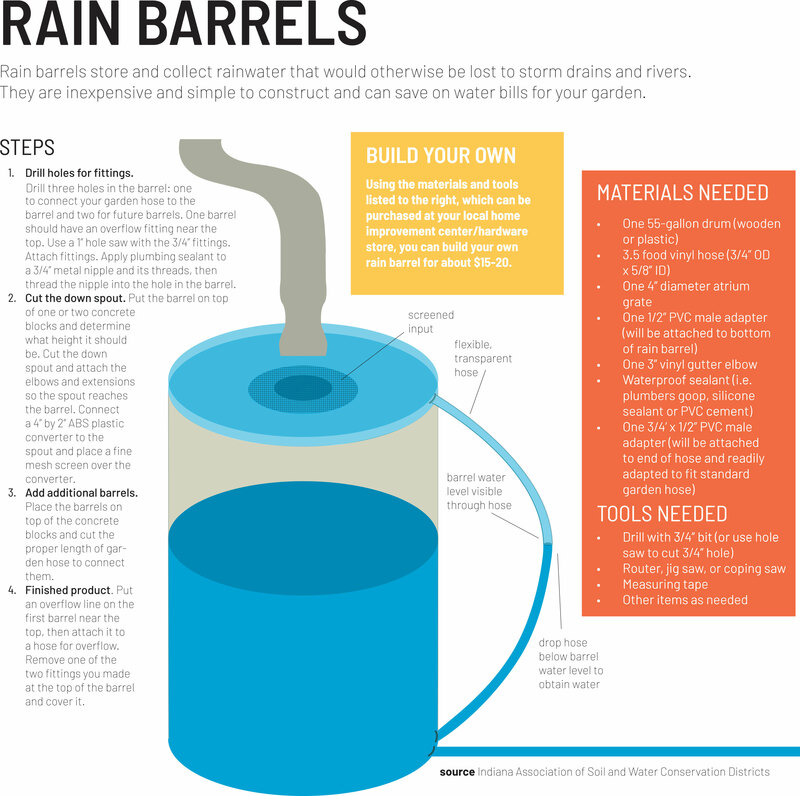 Rain barrels can also help control the amount of water entering a yard and reduce flooding or ponding after rain. The initial cost of a barrel is between $50-75. To help offset this cost, many communities offer rebates or have subsidized rain barrels programs. Lane said these programs also help towns educate people on water usage and help prevent future problems. Lane sees setting up rain barrels as a small action everyone can take and as a gateway conservation practice. “It is something easy for people to get started with, but then it’s also easy to build on so that they can do other things that are good for the environment too,” she said. Kimball has experienced that progression first hand. Forty percent of all water use in summer months is on lawn and garden care, according to the Hamilton County Soil & Water Conservation District. That number could be reduced by simply collecting water for free in a rain barrel. 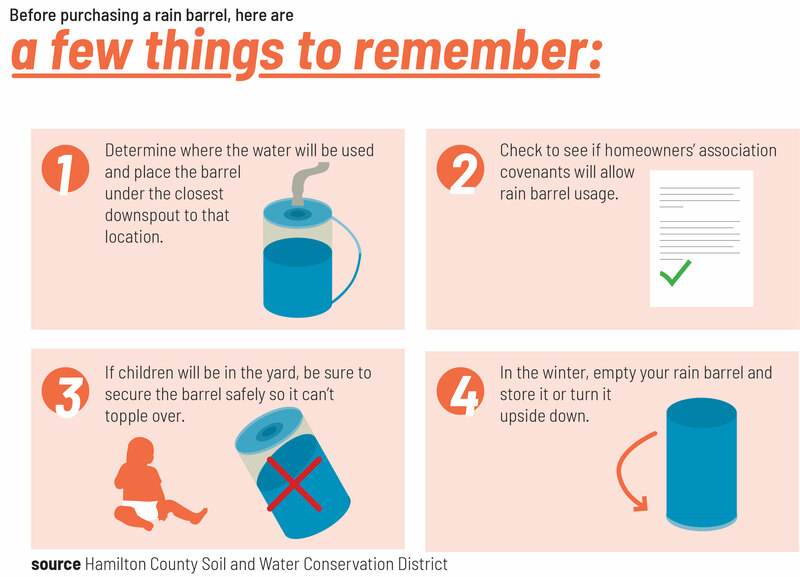 A rain barrel is typically a 55-gallon container, placed under a downspout to collect rainwater from a roof. The initial cost of a barrel is between $50-75. To help offset this cost, many communities offer rebates or have subsidized rain barrel programs. In addition to gardening, the water can be used to wash pets and cars, or for a pool, but it can’t be used as drinking water.